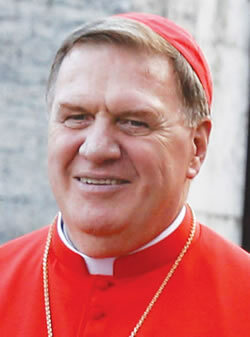 Archbishop Tobin was appointed to Indianapolis on Oct. 18, 2012 by Pope Benedict XVI. His installation Mass occurred on Monday, Dec. 3 at SS. Peter and Paul Cathedral in Indianapolis. He was named a Cardinal on Oct. 9, 2016, and then named the Archbishop of Newark on Nov. 7 of the same year. He was installed in Newark on Jan. 6, 2017. Learn more about Cardinal Tobin using the links below. Cardinal-designate Joseph W. Tobin named the Archbishop of Newark, N.J.
See the stories from our 56-page keepsake edition and learn more about the life of Archbishop Tobin, as well as information about his upcoming installation and his thoughts on leading our archdiocese.